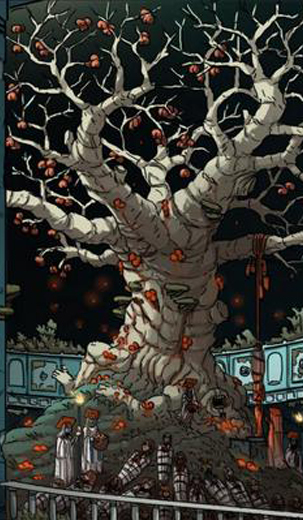 The Gulthias Tree (elven; "one who feeds") is an intelligent and malevolent tree that grew over the tomb of the vampire Dyne in Caer Teithio. Dyne was defeated with the sword Tairne plunged in her heart, but the vampire's blood overtook with sword with a dreadful power. In time, tendrils of new growth sprouted, growing into a great tree infused with Dyne's evil essence. Unicorns will not go near it, and if the unicorn's heart is pierced by the wood of a Gulthias Tree and its horn removed, it becomes a Nightmare under the thrall of whomever posses its horn.